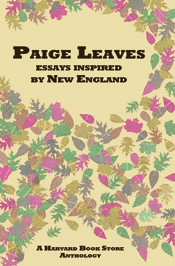 With that in mind, in late summer of 2012, we launched our New England Essay Contest, collecting short essays (no more than 1,500 words) about or set in New England. We received almost one hundred entries, from lifelong New Englanders and more recent arrivals, each with a different perspective on the region. We spent weeks whittling the list down to the twenty-five that appear here. The result is Paige Leaves, a new anthology printed here at Harvard Book Store on Paige M. Gutenborg, our book-making robot. Thanks to our contributors, judges, and thank you for checking out Paige Leaves!